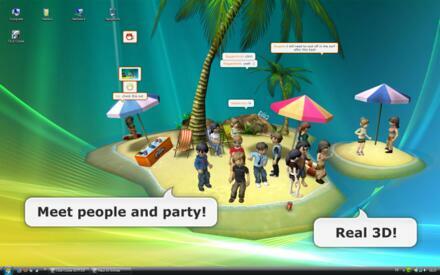 Club Cooee is a fun F2P 3D Online Chat for Windows and Mac devices, developed by Club Cooee. Club Cooee is a 3D social chat platform where users can create their own identity with their own unique, fully customisable avatars, and join or create their own 3D chat room environments. With a wide variety of features from DJ rooms, Quiz rooms and player rooms that users can furnish with a wide variety of items, chatting with other people has never been so easy or so fun. Completely free to play the title is cross platform between Windows PC and Mac users. When first setting foot into the world of Club Cooee users are tasked with creating their own avatar, a caricatured version of themselves, or simply a version they would like to be seen as. From the general facial appearance menu players can change their hair style, eye, mouth and eyebrow shape and create a wide choice of different looks with different skin colours from natural tones to alien green and Avatar blue! Your look can be updated and changed at any time, but this is only the first part of the process to customising your character as players have access to an extensive market of items and accessories to really give their character little extra flair and personality. In the Shop players can browse a huge selection of items broken down into different categories ranging from hats, shirts/T-shirts, pants, shoes and various accessories such as flowers that they can carry. Items can be searched for by name or filtered with a number of options from whether an item is for VIP players on the (subscribed players) or ordering them from cheapest item to most expensive and vice versa). Please purchase items with two main currencies; Cooee Points (CP) and Cooee Cash (CC), the former being the frequencies that players can earn in the game by performing a variety of activities and the latter being paid premium currency that can be purchased with real-world money. Players can earn CP in a variety of different ways ranging from referring friends, which will give players an initial boost of Points and Cash as well as earning a 5% share of any Cash a preferred friend purchases. Players can share and promote the game with special promotion links or complete Partner Offers and Partner Surveys (companies that advertise in the game) to gain huge amounts of currency. Players will earn CP more passively simply by staying online earning each hour 10CP as well as earning it for every unique visitor that visits one of your personal rooms. There are three types of rooms in the game, personal/player rooms, DJ Rooms and Quiz Rooms. The DJ Rooms and Quiz Rooms are hosted and created by Club Cooee and are public hubs that are moderated by staff and volunteers, there are multiple versions of these buildings broken down into different language/regions and with more strict rules and codes of conduct. The Quiz Rooms have different podiums where players can go in and answer multiple-choice general knowledge questions, competing against other players to get the fastest time and can earn CP in the process. The DJ Rooms are often the most active; again players can earn CP by performing on the DJ decks; a level locked terminal that allows players to play music to the rest of the room whilst they chat to each other. The DJ is able to upload their own songs off their hard drive to play to the room whilst they dance away with a variety of Emotes and Animations, alternatively players can search for YouTube videos that will not only play the music but also show the video on the huge video screen above the DJ box. Player Rooms are personal spaces that players can design and decorate to their own preferences, similar to clothing players can purchase a wide selection of furniture items and accessories to personalise their spaces ranging from beds, couches, and dance podiums and more to create their own personal themes; various items become unlocked as players level up in the game giving them access to more unique furniture. VIP players are benefited with a larger choice of items and some of the larger square foot rooms in comparison to free players, but free players still have a wide choice of items to go through. Players can link numerous rooms together with different doors or even have doors leading to other areas in the game such as lobbies or other rooms. More free MMORPG Games or Social MMO Games.